The world can be a wacky place. America, not surprisingly, tends to take the absurdity to epic levels. How else could we have ended up with a hunger problem AND an obesity problem at the same time? It almost sounds impossible, but we pulled it off flawlessly. Chalk it up to good old American spirit, I guess. Now that we’ve got the problem, it is time to solve it. Fortunately, BrainLazy is up to the task with our “outside the box” and “unlimited by feasibility or morality issues” thinking. The solution I have in mind, like most great ideas, is simple. Why are people starving? Because they don’t have money for food. Why are people fat? Because the foods they CAN afford are loaded with fat and calories. Ideally, we should come up with an idea that tackles both problems at the simultaneously… And maybe some others for good measure. I think what I’ve come up with fits the bill pretty well. Simply base the price on the number of calories. How does this help the hungry? Simple. Since the average human being needs a fairly standardized amount of calories to thrive, set the price per calorie so that the poor can afford this much, and they are guaranteed to be able to afford it. So long as you buy low cal foods, meals will be nice and cheap and your belly will be nice and full. That seems like a pretty good solution to me. The only food that you wouldn’t be able to afford, the only food that would cost more than that, would be by definition more than you need. That takes care of hunger. Now how does that help with obesity? Well I would hope that would be obvious.Eating too much would suddenly become very expensive. Sure, scarfing down five whoppers seems like a fun way to spend an afternoon, but you might think twice if it was going to cost you $200. The main reason that obesity is such a big problem in this country is that the easiest way to make cheap food delicious is to pile on the fat and sugar. If doing that makes food prohibitively expensive, they simply won’t do it. It will be cheaper and more profitable to make food that is healthy and nutritious. They will have to buy said food in giant quantities, thus gaining quantity discount and lowering the price. That means that the good food will be readily available, thus that’s what parents will shove down their kids’ necks, and America will get healthier. Done and done. There are actually some other good side effects to this whole plan, too. Some rich people eat expensive things not because they are delicious, but because they are expensive. These people will switch from goose liver and gold dipped candies to the KFC double down and the Monster Thick Burger. Their health will plummet, and before long it will be the arrogant rich people who are dropping like flies from heart disease and high blood pressure, while the lower classes enjoy the advantages of low cholesterol. The health epidemic will target the idle rich, and if there is one thing the world needs less of, it is the sort of person who lives only to rub their money in other people’s faces. 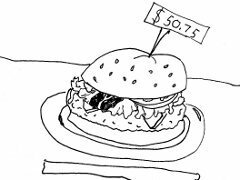 Getting the cost per calorie (CPC) just right would be tricky. It would probably have to be tied to the minimum wage and average family size. Chances are the cost would have to increase exponentially with calories in order to achieve the full effect, but once we had a formula it would just be a matter of turning the crank, and that would be that. Now, having thus established how wonderfully simple and effective this plan is, do I think we should do it? Hell no! The greatest part of being an American is having the right to be as smart or as stupid as you please. Freedom, my friends, means being able to wrap your fried cheese in bacon and dip it in gravy if you want to. It has been said that America is about the balance between the freedom FROM and the freedom TO. I, personally, would much rather have the freedom to make mistakes than have the freedom from consequences… Plus, I really like bacon.